The Burrata Salad was a layering of burrata (more about that deliciousness coming soon) heirloom tomato, and a spicy cauliflower relish. 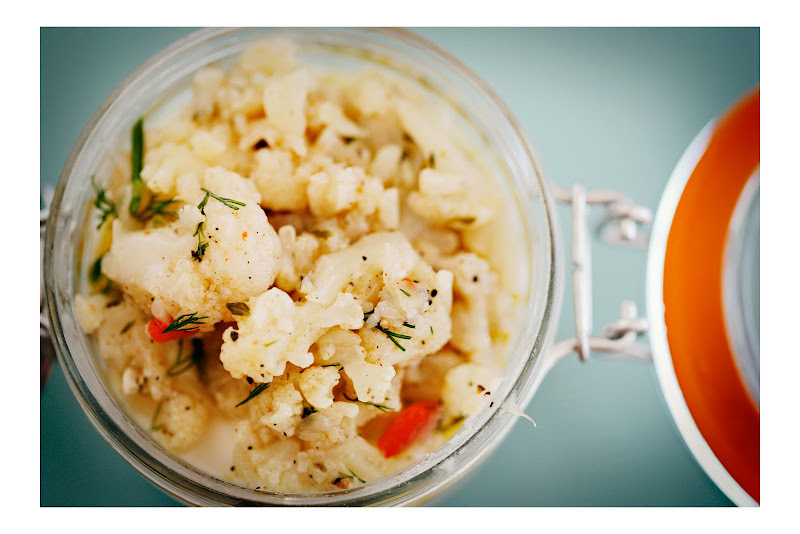 Below is part one...the cauliflower relish. It is absolutely delicious. We packaged small jars of this for our guests to take home as favors...and were very happy to keep one jar for ourselves. It is wonderful over fish, in pasta or on toast with avocados. Saute whole chilies, garlic, anchovies in oil till the anchovies melt. Add the thyme springs, peppercorns, bell pepper, red onion and bay leaves and saute till the onion cooks through. Add the cauliflower and season mixture with salt. Transfer mixture to a bowl and add white balsamic to the pan just used to make the cauliflower, reduce vinegar by half. Once reduce add to the cauliflower along with the fresh ginger and lemon juice. Allow to sit in refrigerator one day to allow all the flavors to bloom. Never would have thought to make this- it looks delicious! It has some interesting ingredients- especially chilis, anchovies and ginger. It will be great fun to try! sounds so interesting, different. I would think this keeps a while in the fridge? This was one of the best things about the picnic--getting to take home this little jar of pure deliciousness (actually, two jars, since my husband and I each took one)! The relish was fabulous on the burrata and tomato, as used during the Sunday Suppers picnic . . . but I can tell you that it's also very good with a couple of boiled eggs. Yes, it does keep for a long time in the fridge. Not sure how long exactly, since my attempts to ration it were mostly failures. It is now gone, so I'm thrilled to have the recipe as a great memory of my day with the great folks of Sunday Suppers, and a gift that will keep on giving, as I'll use it repeatedly in my kitchen, I'm sure. Thanks, Karen, Camille, and Co.
hehe, another fan of micro plane. I love this stuff.